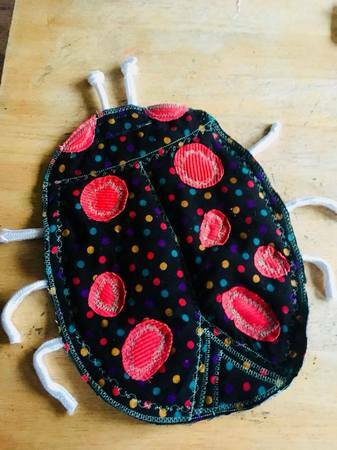 Cuddly toy bug craft workshop gonna be sew much fun! Transition Stirling launches a Wildlife Sew-Art workshop at the Riverbank Resource Centre from September 12. The Stirling Council supported workshops aim to raise public awareness of enhancing pollinating insects’ natural habitats by encouraging people to have fun making stuffed butterflies, ladybirds and earth worms. The cuddly insect sewing workshops will be held from 10am-12pm on Wednesday September 12. A community art installation using recycled textile and haberdashery items will be on display for at least a week in the gardens of the Riverbank Resource Centre from September 12. Transition Stirling’s Event Coordinator Beverley Hooper said: “The objective of our workshops is to highlight the possibilities of reducing, reusing, recycling and repairing items and resources which might otherwise be thrown away. Caroline Jones, the Community Artist leading the event, said: ‘It’s amazing what can be produced with a little bit of imagination and some elementary sewing skills. Transition Stirling is an environmental charity encouraging people to live more sustainable lifestyles. TV naturalist Chris Packham recently visited a local wildflower project at Beechwood, Stirling as part of a Bioblitz study promoting protection of the UK’s insect life. And the Riverside Resource Centre has been supporting local wildlife by raising butterflies and educating the public about their conservation and life cycle.